Lasers made for skin resurfacing have come a very long way—and as a laser pioneer, Dr. Brent J. Smith has been there for the journey. 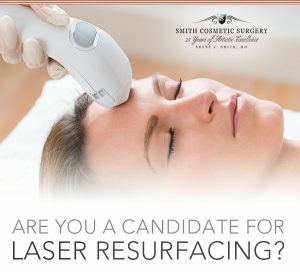 As one of the first facial plastic surgery centers in the country to perform full-face laser skin resurfacing, Smith Cosmetic Surgery has leveraged laser technology to create younger-looking skin on more than 10,000 patients for more than 25 years. If you desire smoother, younger-looking skin, laser resurfacing may be right for you. The CO2 lasers we use at Smith Cosmetic Surgery are safe, highly effective and customizable for most all skin conditions. Laser skin resurfacing is a wonderful way to complement and extend the look of a surgical procedure, such as a cheek, neck or chin lift. In fact, we often see that it’s the secondary skin resurfacing procedure that enhances mature skin in the most dramatic way. Sometimes we call it the magic eraser, because while we can’t rely on it to surgically lift and contour angles of the face, we can count on laser resurfacing to gently remove older layers of skin to smooth and erase some of the most visible signs of aging – from brown spots and wrinkles to acne scarring and sun damage. In fact, there’s rarely a person that walks in the doors of Smith Cosmetic Surgery that could not benefit from the powerful revisions made possible by today’s most advanced cosmetic lasers. That’s why we say that most everyone, really, is a candidate for laser skin resurfacing. One of the biggest misconceptions is that the most outwardly visible signs of aging are structural issues such as drooping jowls, wrinkling foreheads and turkey necks. But that’s simply not the case. Have you ever seen someone with amazing cheekbones but horrible skin? All you can focus on is the weathered, spotty or pockmarked skin, right? This surface layer says so much about who we are—and how old we are. The real impression we have of others starts with healthy skin. Let’s look at another example: an outdoor athlete whose face has been beaten by sun, who looks both extremely weathered and gaunt. Which issue is worth fixing first? We’d argue both. If you add some plumpness to sunken cheeks with a well-crafted facelift and beautifully sculpted fat grafting, you’re still left with a lifetime of leather on your face. That’s why lifts and lasers go hand-in-hand. Once Dr. Smith explains the benefits of scheduling both procedures, some 85 percent of Smith Cosmetic Surgery patients choose to have laser skin resurfacing in combination with a facelift. So let’s address each of these. First: Myths. Myths exist for all elective procedures, whether it’s Lasik or laser skin resurfacing. Usually these are singular stories overheard and passed along, either by word of mouth or online. By the time they reach you they have morphed into a tragic half-truth. There is also a lot of misinformation on the internet and broadcast to consumers daily in the form of misleading advertising. Many myths related to lasers have to do with misunderstandings about how they actually work—and how far they have come since they were first used for skin resurfacing. There are widely varying myths about how deep lasers go, how they make your skin look, how long it takes to recover from resurfacing and how long the effects last. The only way to know if something like laser resurfacing is right for you is to come in for a complimentary consultation and learn about the state-of-the-art CO2 lasers and techniques that we employ at Smith Cosmetic Surgery. Second: the evolution of lasers. Dr. Smith will be the first to admit that early lasers used in cosmetic work were crude compared to the remarkably precise CO2 laser machines used today. Because of early lasers’ high heat output sometimes skin would turn redder than expected and recovery times for skin to return to normal tones was quite long. Today, the top lasers on the market have fine-pulsing energy streams that doctors can customize for the needs of each patient—only going as deep, long or wide as necessary. Likewise, old lasers often left a more distinct line of demarcation between where the laser was applied and where it wasn’t. That often left certain parts of the face looking “waxy,” which was not an ideal outcome for anyone. Modern lasers like the fractional CO2 lasers we use at Smith Cosmetic Surgery are blending masters. They are so fine-tuned that Dr. Smith can merge resurfaced skin right into the neck, jowls or forehead, for example, in a natural and nearly unnoticeable way. Recovery times will always vary by patient. The more aggressive the laser work for deeply damaged skin, the longer it will take to regenerate new collagen and skin over top. But typically, healing can occur in as little as three to five days for lighter, finer laser work and 10 days for deeper laser applications. Lastly: Not all lasers (and surgeons) are the same. At Smith Cosmetic Surgery, we have purchased our own suite of CO2 laser equipment, considered some of the best on the market today. Did you know that many plastic surgeons rent lasers for certain days each month and squeeze in all of their skin resurfacing patients on those days? Often, rented lasers are bounced around during transportation and used in unknown ways by other surgeons. We don’t trust that approach—and neither should you. Most importantly, your first priority should be choosing a surgeon or registered nurse for laser skin resurfacing who is highly trained, stays current on new laser technology, performs hundreds of laser procedures a year and truly understands how to customize the experience for every individual face. You don’t want a tech performing laser work; you want a trained surgeon or medical nurse. As the country’s original full-face laser treatment surgeon, performing over 400 procedures each year, you can trust Dr. Smith to show you all the beauty and benefits of contemporary skin resurfacing. Is Facial Plastic Surgery a Wise Investment?